Werewolf time – one person eaten and a young woman, Hayden, being bitten. The fact that Mick’s book learning Men of Letters failed so spectacularly against the vampires kind of gives Dean a lot of ammunition here. This doesn’t promise to be a good road trop. Sam still wants to help Mick learn because, if they’re working together, it’s better that the Men of Letters be more capable. We also continue to explore more of the ways the Men of Letters does things – including how they’ve wiped out werewolves in Britain… Sam and Dean both speak up on that one. They’ve met werewolves who have been able to control themselves – Garth the Annoying is a werewolf after all. Slaughtering all werewolves regardless of who they are, how they try to live or whether they’ve killed or not is not ok. In fact, while it’s not common, the Winchesters have certainly found the odd monster out there that isn’t entirely monstrous. It’s played for laughs – but it again shows the extremely different contexts they work in. How the Men of Letters have made everything so calm and civilised and safe that Mick is completely out of place in the more desperate frontier of America. They investigate – including interviewing the grieving family and Mick doesn’t do too badly pretending to be a doctor… and he discovers Hayden has been bitten and is due to turn. They also discover Claire is here, hunter Claire who they have a long history with. She’s here without Jody’s knowledge because while Jody will take her hunting she then tries to keep Claire in the car. Claire is much more of a lone wolf anyway. The Winchesters aren’t a fan of this and we continue to have the whole big-brother vibe: protective from Sam and jokey from Dean. It’s a bit paternalistic and annoyingly controlling but they don’t try to stop her or completely remove her choices. Perhaps criticise and be very involved in them – but ultimately they do tend to leave them in her hands. Mick also lies to the Winchesters about Hayden being bitten – so he can go back without them and inject her with silver – killing her. He tries to keep this secret but the next day as they’re investigating (Claire with Sam interviewing Hayden’s friends and doing an excellent job because she’s not a 30 year old man) he and Dean are interviewing suspects while Dean pokes Mick’s actions. Mick spills his secret since Dean already knows exactly what Mick’s done and is extremely not happy about Mick killing a child and giving her no chance to prove herself. Dean also refers to Magda – the psychic child who was horrifically abused who he and Sam decided to save. And the Men of Letters killed. But I’m more interested in Dean here. 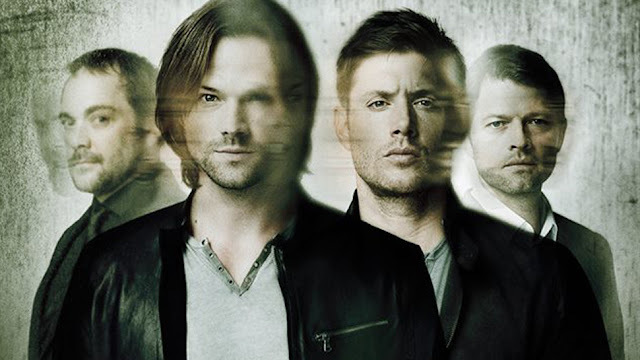 For the last few episodes – seasons even – Dean has been becoming harder. We even saw this brutally with the common cause he made with Arthur Ketch. Dean has been very much about killing the monsters and less and less focused on saving people. But, ultimately, to Dean and Sam it is about saving people and no matter how brutal they get. No matter how much of a killer Dean becomes, this is a line. It’s an interesting evolution: way back the beginning the Winchesters were much more focused on saving people and less death focused – but at the same time they didn’t hesitate to kill any monster. Now they’re more lethal and even more brutal – yet have a more nuanced view of what makes a monster. I think it’s also a comment, again, of who has been on the front lines. Mick hasn’t – and he has simple rules, lots of them, but simple. He has policies he has to apply. Orders to follow. Which is all well and good when monster hunting is on paper. While Sam and Dean work cases – they have experience and knowledge, but each case is separate and approached on its own merits with a knowledge that not everything is the same. Sam and Dean have taken “rules” applied them to reality and found how often things are not that simple. When Sam learns as well he’s also furious – despite being the pro-men-of-letters side he is officially done with them after Mick killed a child. That’s a deal breaker. Among all the fighting, Mick shoots the werewolf. Which apparently is redemptive because everyone’s willing to give him a second chance? Which I’m not buying to be honest. I mean what did Mick do that remotely make up for child killing?